After many suggestions (two) and a long 5 seconds of thinking, I decided to keep all my mods on this blog instead of separating them into two. I deleted the other one. I couldn't even find a good name for it and there was only one post anyway so no harm done. I finally managed to import stuff in Skyrim with only Blender and Nifskope. Thanks to Bagserk who helped me with many problems. Without him, I'd still be depressing. This is a very good thing for me because, unlike so many people, I find Blender to be a much easier tool to use than 3dsmax. 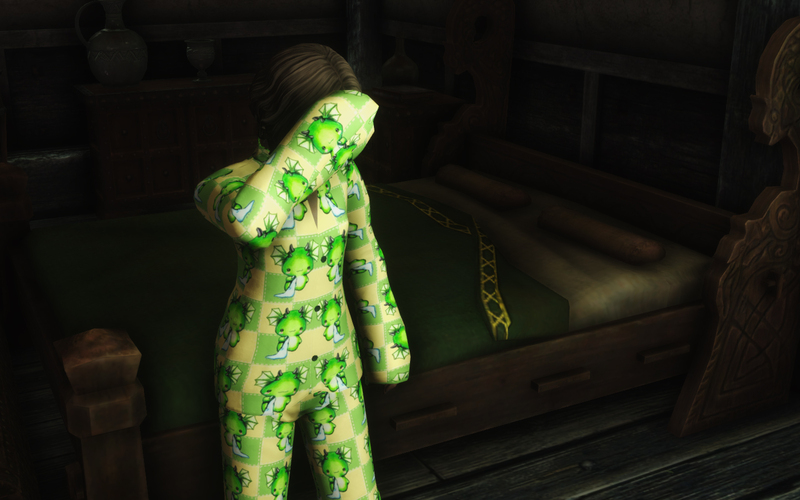 Pajamas were the first thing I wanted to import because we had some kind of a joke before Skyrim launch about making a loli with a cute dragon pajamas to brave the cold Skyrim nights.